1. Halve and stone the peaches. Melt the butter in a large frying pan over a medium heat. Add the sugar and stir until dissolved. 2. Mix half of the vanilla seeds into the sugar mixture, along with the pod, then place the peaches in the pan, cut-side down. Cook, covered, for 6-7 minutes until golden, then turn over and remove the pan from the heat. 3. Add the sweet wine. Return the pan to the heat and simmer very gently for 3-4 minutes until slightly thickened, basting the peaches all the time. 4. Meanwhile, mix the mascarpone, yogurt and reserved vanilla seeds together. 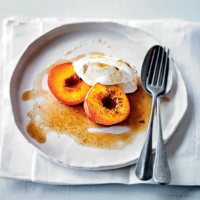 Serve with the hot peaches.